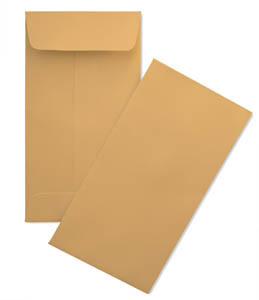 This 5-1/2 by 7-1/2 Coin 28lb Brown Kraft envelope (Also Called a 4-1/4 Scarf) is basically a small Catalog envelope. Both envelopes have a catalog style flap which opens on the shortest side and center seam construction. This envelope is great for sending or storing small parts, currency, and more.